english name "Boedijn's Slender Caesar"
1. E. J. H. Corner's watercolor of the material placed in Amanita similis by Corner and Bas. The following is based on the original description by Boedijn (1951) from Javan material. The cap of Amanita similis is 50 - 120 mm wide, convex at first, then plano-convex, smooth, grayish brown in the center, between isabelline and light brownish olive, gradually changing to honey yellow to chamois near the margin, with a sulcate-striate margin (nearly 50% of the radius). The volva is absent but sometimes present as a single, white, membranous patch. The flesh is rather thin, dirty white, up to 5 mm thick over the stem, rapidly thinning to a membrane over most of the length of the marginal striations. The gills are free, pale or naphthalene yellow in side view, mustard yellow to amber yellow in mass, up to 14 mm broad. The stem is 100 - 150 × 8 - 16 mm, hollow, fibrillose, narrowing upward, grayish yellow near the top, mustard yellow near the base, with the colors somewhat dingy above, brighter towards the base. The ring is grayish, 20 - 35 mm from the top of the stem, membranous, skirt-like, and falling against the stem. The saccate volva is attached only near the base of the stem, grayish on the outer surface, and 20 - 35 mm wide. The flesh is 2 - 3 mm thick. The spores measure (9.5-) 10 - 12 (-14) × (6.5-) 7 - 8 (-9) µm. Spore measurements not including extremes of length and width were called the "most common dimensions" by Boedijn. This species was originally described from Java. The following is based on Corner and Bas (1962) from Malayan and Singapore material. The cap of Amanita similis is 60 - 130 mm wide, cylindric-bell shaped at first, becoming plane to slightly concave and subumbonate, viscidat first when moist, dark bistre to dark brownish olivaceous or olivaceous-umber in the center, with the outer striate part varying from wine-pink to reddish orange to pale orange or yellowish, entirely olivaceous-umber in age, with a sulcate-striate margin (30 - 50% of the radius). The cap gives the appearance of having innate radial fibers or streaks. Volval remains are absent. The flesh is soft, 4 - 8 mm thick above the stem, pale yellowish to yellowish white, deeper yellow below the cap skin. 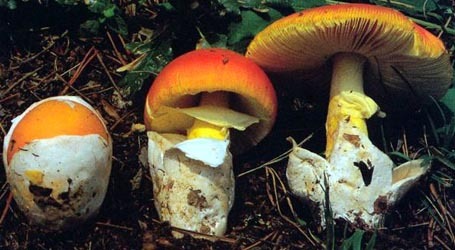 The gills are free, crowded, 5 - 10 mm broad, pale yellow or yellowish white in side view, with a deep yellow, orange or pinkish orange floccose edge. The short gills are truncate, obliquely truncate, or sometimes attenuate, plentiful, and unevenly distributed. The stem is 100 - 180 × 6.5 - 15 mm, narrowing upward, hollow, canary yellow to pale yellow orange or pale yellow, marked with orange to pinkish orange or concolorous floccose-fibrillose concentric zones below the ring and above the volva, striate and fibrillose above the ring. The ring is skirt-like, 20 - 35 mm from the top of the stem, thin, membranous, extending 12 - 17 mm from the stem, pinkish orange to pale orange to orange-yellow, slightly striate above, more yellowish and subfloccose on the underside, and rapidly collapsing. The saccate volva is 25 - 50 × 10 - 30 mm, white, sometimes with dingy brownish stains, rather thick, firm, with an irregularly lobed edge, attached only at the very base of the stem, with an indistinct internal limb placed a few millimeters above the point of attachment to the stem. The spores measure 7.0 - 9.9 × (5.4-) 6.1 - 8.6 µm from dried material and 8 - 11 × 7 - 9 µm (or smaller) from fresh material and are broadly ellipsoid to ellipsoid, occasionally subglobose and inamyloid. Clamps are present at bases of basidia. The following is based on the description by Hongo (1975) from Japanese material. The cap of Amanita similis is 80 - 90 mm wide, convex then expanded and somewhat umbonate, viscid at first, innately streaked, bronze to honey yellow, darkest in the center, with a sulcate-striate margin (30 - 50% of the radius). The flesh is pale yellow, bright yellow underneath the cap skin especially under the umbo. The gills are free, close, pastel yellow, 6 - 7 mm broad, with a gray-brown floccose- crenulate edge, with decurrent lines at the top of the stem. The short gills are obliquely truncate. The stem is 110 - 130 × 10 - 13 mm, slightly tapering upward, stuffed, maize yellow to butter yellow, with dingy yellow incomplete concentric zones from the underside of the ring to the top of the volval limb. The ring is superior, brownish yellow, membranous, striate on the upper surface. The volva is white, thick in the lower part, thinning out toward the margin. The spores measure 7.5 - 10.5 × 5.5 - 7.5 µm are are broadly ellipsoid and inamyloid. The Japanese material is associated with pine and oak. 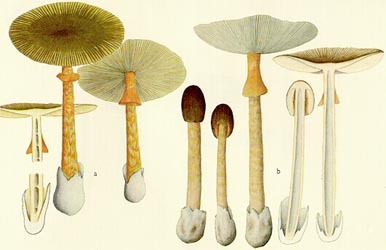 Hongo's watercolor of this species (Imazeki & Hongo 1987 (plate 29)) shows a distinctly brownish tint to the stem and to the squamules that decorate it. As a consequence, there are no bright colors on it. The ring has collapsed on the stem and is distinctly browner than the brownest yellow of the stem, more like a yellowish light brown. The three descriptions differ primarily in the color of the stem and its decoration, the color of the ring on the stem, the color in the area of the cap striations and just at its margin. Unfortunately we are not able to fully interpret the available information on spore size and shape. Boedijn presents five spore drawings with a length/width ratio ranging from approximately 1.4 - 1.6. Hongo presents two drawings in approximately lateral view with a length/width ratio ranging from approximately 1.4 - 1.55. In both cases, estimation of the average ratio based on the printed spore measurement is consistent with the ratios computed from the spore drawings—1.45 in the first case, 1.4 in the second case. The same ratio computed from the drawing of five spores from Corner and Bas yields a range of 1.15 - 1.4. Estimates of the average ratio from each of the three sets of spore measurements that they give range from 1.15 - 1.25. It would appear from this evidence that the spores of the Singapore material are proportionately broader than the spores reported from the other two regions. We emphasize that we do not consider that we can make a definitive statement. Unfortunately we are unfamiliar with the material from all three areas. author Boedijn. 1951. Sydowia 5: 322, fig. 3(2). ≡Amanita hemibapha subsp. similis (Boedijn) Corner & Bas. 1962. Persoonia 2: 295, pl. 11, fig. 54.
etymology similis "resembling" or "similar"
The following material is derived from the protolog of the present taxxon and from the revision of Corner & Bas (1962). basidiospores Corner & Bas (1962): [-/-/-] 7.0 - 9.9 × (5.4-) 6.1 - 8.6 μm, Q = 1.05 - 1.40; Q = 1.20), hyaline, colorless, smooth, thin-walled, inamyloid, broadly ellipsoid to elipsoid, sometimes subglobose; apiculus proportionately rather broad; contents cloudy vacuolate to multi- or monoguttulate; color in deposit not recorded. Note: Spores reported to measure 8.0 - 11.0 — 7.0 - 9.0 μm when fresh. ecology Corner & Bas (1962): Solitary to gregarious. Malaysia: At 1700± m elev. Terrestrial in forest. Singapore: Terrestrial in forest, coming up soon after rains (March and August). Borneo, Indonesia: Corner reported "a large troop...in 1961 near the Mesilau River, on Mt. Kinabalu at about 1700 m alt. in oak-forest" that was not collected. material examined from protolog: INDONESIA: JAVA—ca. Sukabumi, Gunung Telaga [ca. 1650 m], 26.xi.1939 von Steenis s.n. (holotype implicit, BO? or L?). Corner & Bas (1962): MALAYSIA: JOHOR—Gunong Panti, viii.1929 E. J. H. Corner s.n. (L). NEGRI SEMBILAN—Angsi Forest Reserve, 750 m elev., 3.vii.1930 E. J. H. Corner s.n. (L). SINGAPORE: Bukit Timah, 16.viii.1939 E. J. H. Corner s.n. (L), 18.xii.1940 E. J. H. Corner s.n. (L, watercolor drawing only), 16.ii.1943 E. J. H. Corner s.n. (L, watercolor drawing only). citations The editors are grateful to Dr. Joost Stalpers for assisting us in specifying the type locality of the present species.